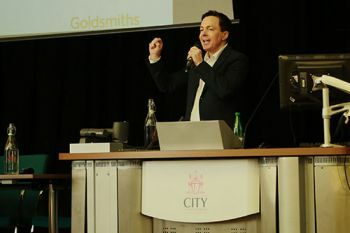 Over 300 psychologists and professionals from the occupational health, mental health and HR worlds came to City at the start of June for an event that discussed the use Acceptance and Commitment Therapy (ACT) in the workplace. Building on expertise in the Department of Psychology, and particular the work of Dr Paul Flaxman, the day - which was in partnership with Mind in Hackney, NHS partners and also Goldsmiths, University of London - featured panel discussions and workshops for demonstrating the benefits of using ACT in workplace settings. Introducing the day, Dr Flaxman engaged people in a three-step mindfulness exercise to start the event. He went on to discuss the history of ACT-based training and research that has been led by City and Goldsmiths, University of London. Discussing the day ahead, Dr Flaxman mentioned that the focus of the day was knowledge exchange, and highlighted that there was a lot to learn from everyone at the event. Following Dr Flaxman’s introduction, there was a panel discussion featuring ACT practitioners from a variety of areas. The panel included Duncan Gillard, senior educational psychologist at Bristol Council: Liz Tallentire, a clinical psychologist and mindfulness trainer at Bolton and Lancashire NHS trust; Teresa Jennings, head of the staff support service at Northumbria healthcare trust; Hana Villar, clinical director of Mind in Hackney; and Ross McIntosh, cofounder of the ACT3 Psychology training and coaching constancy. While discussing programmes that they are currently delivering, they also spoke about the challenges they have faced. The panel also offered tips for picking up ACT with the delegates highlighting the importance of group support and also promotion. Evaluation was also highlighted as being important, and the group discussed the benefits of buy-in at senior level, as well as the critical importance of using ACT processes in one’s own life if considering delivering ACT-based training. The day finished with a keynote lecture from Professor Frank Bond, which discussed his most recent research on psychological flexibility. He emphasised the importance of ‘observing the observer,’ which he described as being able to ‘look at situations from the perspective of ‘I’. He referred to this as ‘realising you are noticing your thoughts, feelings, urges, memories, and other internal events’ and stressed the importance of the separation between what is observed and the one observing (‘deictic I’). This ACT conference is the second prominent event since the launch of the Centre of Psychological Wellbeing and Neuroscience in 2015. The centre is committed to fostering active research partnerships with NHS Trusts and local health and social care agencies and to hosting future research-led knowledge transfer events. Can The Arts help counteract our pleasure-seeking obsessions?